The Normandy-style antique colonial house at 17 River Lane is a wealth of architectural and decorative details. WESTPORT — It stands to reason that a “mover and shaker” in the Westport arts community would live in a home worthy of his love for art in all its forms. Drew Friedman accomplished that with the purchase of the stunning Normandy-style antique colonial house at 17 River Lane. Friedman, a real estate developer, founded the Westport Downtown Merchants Association, and when he died in 2016 he left $500,000 for the establishment of the Drew Friedman Community Arts Center foundation to provide “opportunities and financial support to the arts in Westport and Weston,” according to a May 2018 article in the Westport News. 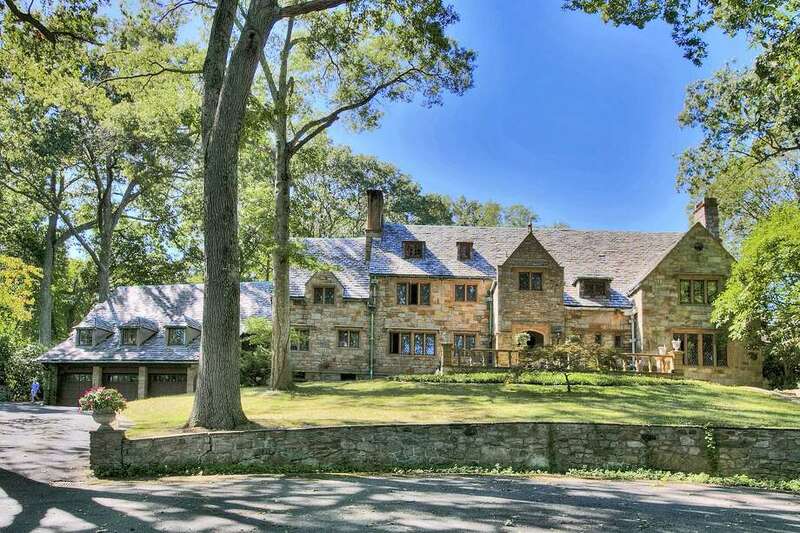 The grand stone mansion sits on a 2.21-acre level and sloping property on a cul-de-sac. It adjoins a second parcel of 1.02 of an acre for a total of totaling 3.23 acres. The house features 14 rooms and 6,588 square feet of impressive architectural and decorative period details reminiscent of a castle or a Euorpean manor house. In fact, stone gate towers mark the entrance to this remarkable property. It was built circa 1929, and local rumor claims this house, in its early days, may have been the site of opulent parties where the guest list included many Hollywood stars and other theatrical luminaries. Today, it remains one of the most historically and culturally significant residences in Westport, according to the listing agents. “This architectural stunner is set atop a knoll and is an imposing feast for the senses” including hand-forged iron work, leaded glass windows, copper gutters with decorative relief details and a slate roof, the agents said. To accommodate a large number of guests for grand entertaining there is ample parking in the lower level forecourt. The long driveway is lined with beautiful landscaping including well-established mountain laurels and rhododendrons, and a variety of tall, mature trees. A long stone wall and stone steps lead up to the front slate terrace and the castle-like Gothic arched front entrance with Gothic door-knocker and hardware. The door opens into the spacious foyer. The foyer sets the tone for the rest of this house with its hand-carved linen-fold patterned paneled walls and decorative plaster ceiling. Hand-carved wood designs frame the arched entryways into genersously sized formal rooms and other spaces. Some of the limestone, plaster and wood carvings depict Tudor roses. Each room has its own unique design features. In the banquet-sized formal dining room there is decorative crown and other molding as well as cove lighting and built-in cabinetry. Medalions of Tudor roses dot the plaster ceiling. Climb three steps and pass through the decorative iron gates to enter the gala-sized formal living room, which features the first of the home’s six fireplaces, a bow window, textured plaster walls, and decorative plaster crown molding and beams. Off the living room is a large sun room with a stone floor and multiple sets of arched French doors to the stunning grounds, which contains a Gunite in-ground swimming pool, a stone courtyard with built-in stone and wood benches, attractive gardens, and a reflective pond with a fountain - although there is currently no water in it. There is a second sun room at the back of the house with the same features. Also off the foyer is an intimate library with built-in shelving, a fireplace with an ornate mantel, and hand-hewn exposed beams. There is also a large room, with a marble tile floor, that is ideal for caterers and bartenders for large-scale entertaining events. Although some people will want to update the eat-in kitchen there is a real charm about it. Features include colorful blue and ochre tiles on the counter that houses the large double porcelain sinks, glass-front cabinetry, and a large pantry. A sign on the pantry door reads “Just another day in paradise,” an apt description for this estate. On the second floor the master suite is in a private wing. There are five additional bedrooms, all of them generously sized. A couple of them have a fireplace. The rear exterior of the house resembles Tudor construction with its stone, stucco and half timbering façade. For more information or to make an appointment to see the house contact Cindy Raney of BrossChingasBross/The Riverside Realty Group at 203-257-8320 or Cindy@TheRiversideRealtyGroup.com.